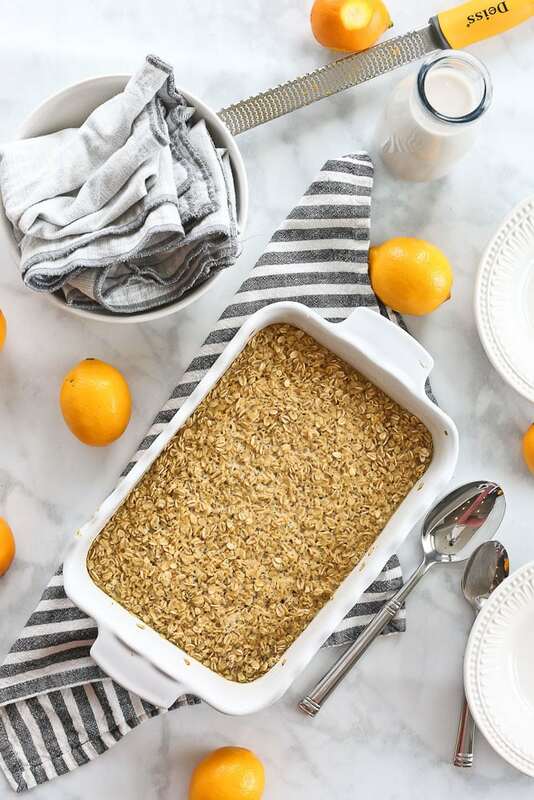 This Lemon Poppyseed Baked Oatmeal recipe uses sweet Meyer lemons and is a creamy, comforting breakfast that happens to be dairy free. Ode to oatmeal. As I write this, I realize I probably have more oatmeal recipes on my site than any one person needs. But at the same time, there is something for everyone. Love berries? Try my Triple Berry Baked Oatmeal. Are apples and cinnamon your jam? Apple Cinnamon Baked Oatmeal is for you. Need chocolate in your life? Well how about this Coconut Chocolate Chip Baked Oatmeal? Want portable options? Wellll try one of these Baked Oatmeal Cups. 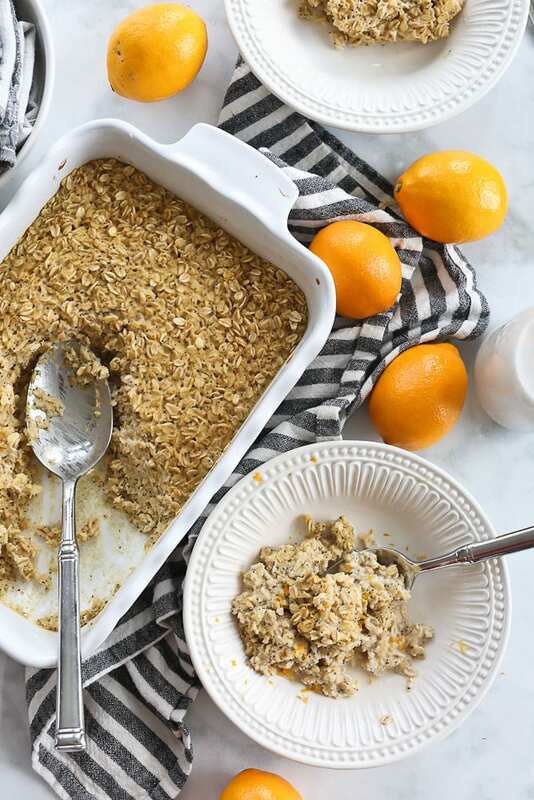 And now I have a Lemon Poppyseed Baked Oatmeal recipe for ya! And it’s pretty fabulous. Each recipe for my baked oatmeal is a little different, with a slightly different flavor, nutrition, or texture goal guiding my recipe development. I think you’re going to love this one. If you’re new to the baked oatmeal world, it’s not quite as loose and creamy as oatmeal you’d cook on the stove top, but not as held-together as a bar. It still has a creamy texture, but is also chewy and soft. I love it. You can serve it with extra milk or without. You choose! Can you prepare baked oatmeal ahead of time? The answer, my friends, is YES! You can mix all of the ingredients the night before and bake it in the morning. 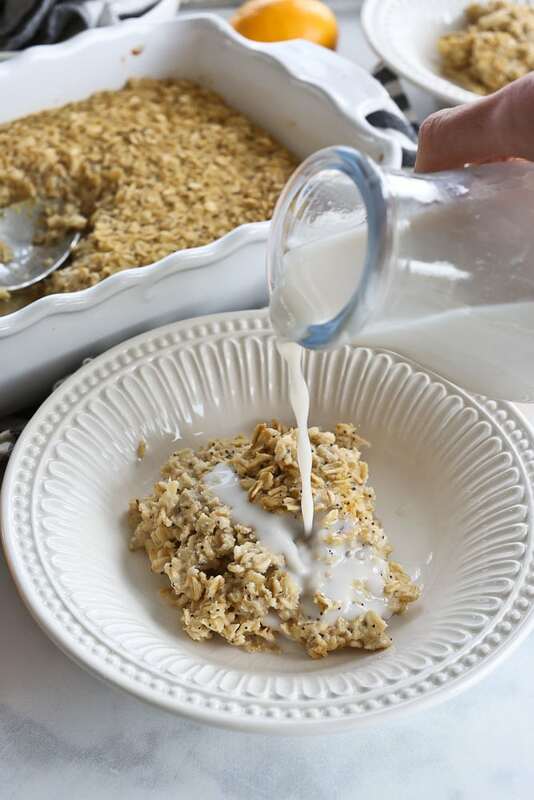 Try it with this Lemon Poppyseed Baked Oatmeal recipe and you’ll see how easy it is. I can’t wait to hear what you think! This Lemon Poppyseed Baked Oatmeal is lightly sweet, creamy, and a warm and comforting healthy breakfast! Preheat the oven to 350 degrees. Lightly grease a medium baking dish and set aside. In a medium bowl, mix together all of the ingredients until well combined. Transfer the oatmeal to the prepared baking dish. Bake, uncovered, in the preheated oven for 20-25 minutes. Enjoy! I had all the ingredients on hand so I had to give this recipe a try. It’s a total winner! Camryn & I are eating it up! Thanks for the delicious recipe. A delicious recipe I ate the first time in my whole life…!! its a very tasty. The recipe you’ve shared on baked oatmeal is really good. Thanks for sharing this article. If you have any technical issue in the context of Microsoft office products then you can contact on Office 365 Support.